We only offer what we believe in. With all of our combined experience, crown has come up with a full take-home shop to fill every need. Bona Fide Pomades - Established in 2012, Bona Fide offers a high performance product. They're American-Made, family-owned, with a simple line-up sure to create any style. Our faves are the Matte Paste + Texture Spray. $7-15. UNITE - This product line uses premium ingredients for high performance. If our crown guests miss having access to Oribe at their appointment, this is the answer. 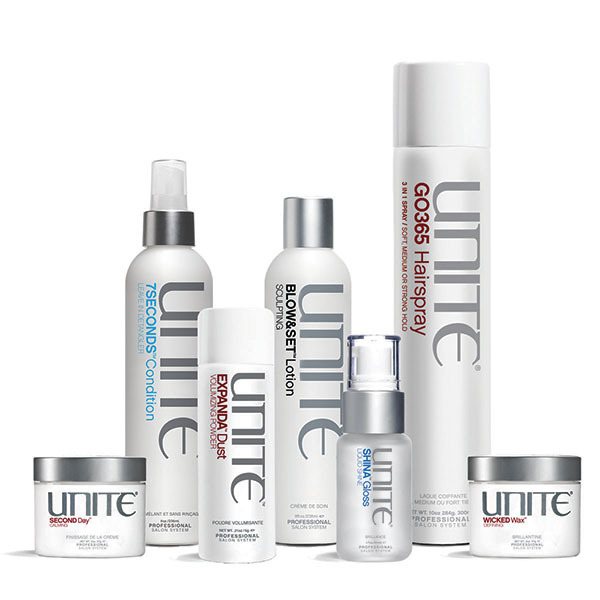 UNITE is proudly sulfate-free, paraben-free, sodium chloride-free + non-animal tested. Tressa Watercolors + Pravana Nevo - These shampoos + color enhancing treatments will keep any shade of red looking brand new. Tried + true, we've found over the years that this pair delivers. Watercolors adds pigment as you cleanse your hair, while the Nevo treatment strengthens + deeply deposits fresh, shiny new color. $20. Pravana: the Perfect Blonde - This line will keep icy blondes free of brassy tones between visits. Sulfate-free, you can completely care for your blonde with this shampoo, conditioner + masque. $20. Olaplex - If you get color at crown, you're probably no stranger to Olaplex: a simple three-step process includes a patented active ingredient that works on a molecular level to seek out broken bonds in the hair that are caused by chemical, thermal + mechanical damage. You can use Olaplex to restore compromised hair, or add it to another service to provide the ultimate breakage insurance. Keep up your hair's integrity between visits! $28. Nioxin - Their Scalp Therapy system helps eliminate seborrheic dermatitis, dandruff + other scalp related problems associated with scalp irritation, flaking + itching as part of total scalp care system. It blends moisturizing green tea polyphenols + a maximum strength dose of pyrithione zinc. $22-23. Brazilian Blowout + B3 - This sulfate-free cleansing system extends the life of the Brazilian Blowout by maintaining the vital moisture and protein balance needed for optimal smoothness and radiant, frizz-free hair. $34. Wella Brilliance - With Wella as our primary color brand, we trust their shampoos + conditioners to keep every color looking as fresh + shiny as possible. We suggest this line for fine to normal hair textures. $ 16.50. Wella Enrich - The Enrich line is specialized to repair damage. Moisturizing with silk extract, you can protect your hair with this shampoo, conditioner + leave-in. $14-16.50. Wella Elements - This collection is free of sulfates, parabens + artificial colorants. Light-weight + gentle, this trio is perfect for the care of sensitive scalps, fusion extensions, color, keratin treatments + permanent waves. $22. Wella Luxe Oil + Sebastian Dark Oil - Buffalo hair always needs moisture! We are loving Wella's Luxe Oil Light Oil Keratin Protection Spray with almond, argan + jojoba oils. Their Keratin Boost Leave-In is a great seal after any masque or treatment. Sebastian's Dark Oil has become a guest favorite at crown. Formulated with sandalwood, cedar wood + argan oil, it protects against UV damage. $22-40. Wella Oil Reflections - Perfect for taming coarse hair that lacks shine. White tea extract gently cleanses + you don't need to leave the conditioner in for very long to achieve maximum shine and softness. You can complete the trio with the Oil Reflections masque as well- our fave way to end a color in the shop. $22. * Many shampoos + conditioner can be special ordered in liter sizes. Just ask! Ask us anything at your next appointment or on our contact form! Don't forget to tag any selfies #crownbflo!